Niagara Falls, New York relies on the $12 million to $14 million a year in Seneca Nation revenue sharing payments. Gov. Andrew Cuomo sent $12.3 million in financial relief to the city of Niagara Falls, because it has been impacted by an ongoing dispute between the Cuomo Adminstration and the Seneca Nation of New York. The Seneca Nation claims the expansion of casino gambling in the state violates the state/tribal gaming compact, so it withheld casino revenue sharing payments as a form of protest. A 2002 gaming compact between the Seneca Nation and New York does not have a requirement to make payments beyond 2016, though it does have provisions for the agreement to roll over beyond that year. When the deal expired, the Seneca Nation stopped payments. The money is placed in an escrow account, but is not delivered to New York state. Some of that cash is earmarked for communities near Senaca casinos, including Niagara Falls. To make up the difference, Cuomo is sending multi-million dollars in aid. Niagara Falls’ budget was $91.4 million in 2017, but its recurring revenues are roughly $80 million. With a $11.4 million spending deficit and the city’s police and firefighter departments facing layoffs, Andrew Cuoma decided to send $12 million in cash to bridge the city until the end of the year. In recent years, the payments made by the Seneca Nation to the city of Niagara Falls has fluctuated. In 2013, the amount was $14.2 million. By 2016, the amount had diminished to $12.3 million. If the Seneca are correct about the impact of the state casinos’ openings on their business, then the amount contributed might be less in 2018. When the Seneca Nation first announced it would stop paying in mid-2017, state officials say the decision to end revenue sharing payments is “beyond law and logic”. They also declared the tribe to be in breach of the 2002 gaming compact. New York filed for arbitration in the case, but the arbitration hearing is not until early December. New York officials are confident they will win in arbitration. Cuomo and his advisors believe, under any interpretation of the 1988 Indian Gaming Act, tribal casinos must make revenue contributions to cover the costs of regulation. The 1988 federal law requires states to make concessions if they tax tribal casinos beyond the cost of regulation, but tribal gaming authorities cannot simply ignore federal laws. In December 2014, the New York State Gaming Commission’s siting panel announced approval for three casino licenses: what eventually became Rivers Casino in Schenectady in the Albany region, Resorts World Catskills (Montreign) in Kiamesha Lake, and Del Lago Resort and Casino in Tyre. Gov. Cuomo pushed for the siting panel to license a fourth casino, which state law allowed, so Jeff Gural’s Tioga Downs racetrack in Nichols County was converted from a standard racecourse to a casino-racetrack or racino. 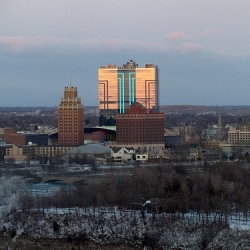 The Seneca Nation particularly resented the casino operations at Tioga Downs and Rivers Casino, because they were placed in the region near the Seneca casinos: Seneca Allegany Casino in Salamanca, Seneca Buffalo Creek Casino, and the Seneca Gaming & Entertainment centers in Irving, Cuba, and Salamanca. In particular, the Seneca claim Rivers Casino was placed on the border of a marked-off area where the state claimed it would not encroach on the Seneca Nation’s gaming territory. Though it technically falls outside the perimeter, it is close enough to affect the tribe’s business and was seen as an unfriendly move. Thus the tribe took the action they did, which also involved a loophole in the law. An arbitrator will decide who is right or wrong in December. Both sides seem confident of their position, though it would be no surprise is an eleventh hour deal is reached when the day of arbitration nears. Such decisions always leave room for error.